Here we have the Type 3 Anti-Tank Hand Grenade. The Japanese were late to develop hollow charge ordnance, probably due to the lack of need as, unlike the Russian and German fronts in Europe, there just was not that much of a heavy armor threat in the early years of WWII. 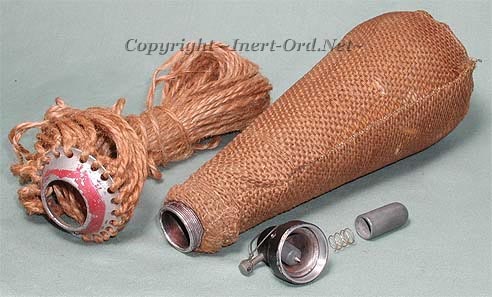 The grenade consists of a thin steel cone mounted on a wooden standoff head. 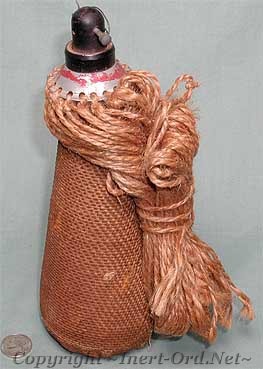 Explosive is cast around the cone and covered by a cloth bag. The upper end has a very simple impact base fuze mechanism. The hemp tail attached at the top would hopefully stabilize the grenade in flight, ensuring it struck the target properly. This grenade would penetrate up to 70mm (almost 3") of armor. While its penetrating ability was a big improvement over the Type 99 Magnetic Grenade, you can see that the overall level of design has significantly deteriorated. As with other Japanese late war weaponry, damage to their manufacturing infrastructure from Allied bombing resulted in a significant reduction in the quality of armament produced towards the end of the war. The fuze mechanism here is very simple and does not have much to show in the way of safety features. Evidently once the safety pin was removed, it was just the creep spring that kept the firing pin from the detonator. Interesting that this example does not match the dimensional data for any of the above mentioned types. It is longer, narrower at the base and has some internal differences in the base/cone geometry. 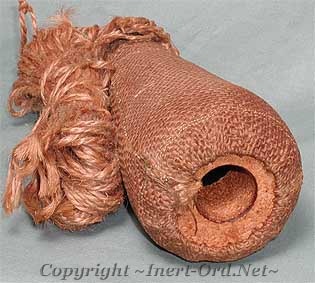 Also the tail and covering are the same hemp material, where on the A,B,C types it seems the body covering was cloth. This grenade was recoverd in the Philippines, most likely shortly after the end of the war (EOD). The IJA field arsenal at Manila produced some AT weapons such as the Lunge AT Mine, and this is most likely a local-made version produced in the occupied territory. This grenade was expertly inerted. The cloth casing was removed, explosives separated from the cone and replaced by a sculpted wood block, then reassembled. Due to the cloth material, the difficulty in inerting it, etc., this an exceedingly rare item to find. The only surviving example I am aware of.